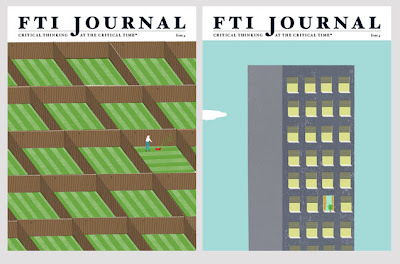 I was recently commissioned to come up with rough ideas for the cover of FTI journal. The piece was about new regulations in the finance sector, and how there is still room for businesses to maneuver. The image had to be non figuraitve, speak to a global market and not take one side of the argument. Overall I did 5 roughs but here are just two. shame. Don't you just hate the 'photography direction'!! They both would have looked great. These are just perfect and I can't imagine how a photograph would've been a better choice for a cover, but ah, it's their loss.